We loved the Receptra Naturals CBD oil Active Lifestyle formula. Perhaps the fact that they use hemp flowers is what did it, or the turmeric extract, but something about this formula took CBD to a different level for us. Even if you aren’t an athlete, you’ll really enjoy using it both for how it makes you feel and how it tastes. If you aren’t a fan of turmeric and are looking for only CBD oil, you can always go with their Health and Wellness formula. Receptra Naturals made believers out of us, and they’ll likely make believers out of you too. 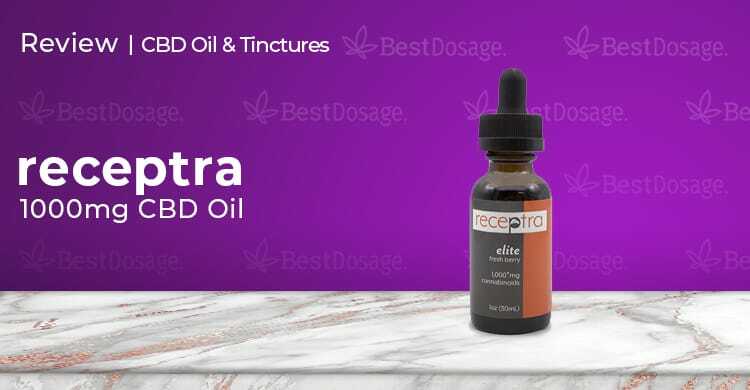 Choosing a bottle of Receptra Naturals CBD oil to review was our first challenge, as they have two different product lines. Here we’ve decided to take a look at their Active Lifestyle formula, which offers a unique appeal. How did it fare in our testing? Keep reading to find out. Yet another company based in Colorado, Receptra Naturals is family run. They’ve been around since 2016 and grow their own hemp, from which CBD is extracted and added to other natural extracts. Their active lifestyle formula is connected with the MMA where a large number of fighters use it, including hall of famer Bas Rutten. Receptra has a bit of a different approach to their product line compared to other CBD brands. Their CBD oils are split into Health and Wellness, and Active Lifestyles formulas. Each is based on hemp extract, but are combined with other oils and extracts. From there, they are further split into dosage levels. All of their 3rd party product testings is clearly shown on their website and they take pride in using organic, whole plant floral extracts. What this means is that they use the hemp flower rather than seeds, stems, or stalks. They also add turmeric extract to their Active Lifestyle formula, which is supposed to aid in achieving optimal mental and physical performance. We liked how the Receptra Naturals CBD oil 100mg bottle was presented and packaged as it arrived. This particular bottle is the Receptra Elite from their Active Lifestyle product line. Receptra Naturals uses different colors to set apart their different tinctures and it lent to a more polished look and a professional appeal. A full ingredient list and instructions for use were printed on the back of the bottle. The feel of high quality continued when we opened it up, where we found a top-notch dropper was used. It’s these little extra efforts that make us appreciate some brands more than others. We were even more pleasantly surprised at how great it tasted! The majority of natural CBD oil products have this earthy taste that not everyone likes. Not Receptra Naturals CBD oil – it has a very pleasant berry flavor that tasted better than any oil we have tried up until this point. Kudos to the folks at Receptra Naturals for giving taste the extra attention it deserves. The label on the bottle suggests using a full dropper between one and three times a day. For the Receptra Naturals CBD oil 1000mg bottle, that means 30mg per dropper. You’re going to want to start lower than that to begin with, especially if you are new to CBD. A half dropper should be the most in the beginning, and then work your way up to a full dropper. Three times a day at 30mg each would be on the high end but, again, it really depends on your personal body chemistry and what ailment you are treating. Not only did the Receptra Naturals CBD oil taste great, it felt great too. It did a really wonderful job on all accounts. For those using it for anxiety, it worked almost very quickly. It did even better for pain, perhaps because this mix is formulated for an active lifestyle. For instance, using it after a work out was absolutely revolution for the gym rat on our team. Only high praises for the effect, and now we understand why all these MMA fighters swear by it. Hemp Seed Oil, MCT Oil, Avocado Oil, Extra Virgin Olive Oil, Grapeseed Oil, Sunflower Oil, Organic Natural Flavors, Turmeric Extract. Clearly, Receptra Naturals wants you to be able to reach them, as they give you phone, email, and live chat options. They’ll even pick up your call on Saturday mornings, which was a nice bonus for the workaholics who can’t take time from their busy workday. We were very happy with their response times, and just a superb overall approach to customer support here. Sadly, no free shipping options. $24.95-$249.95 per bottle, depending on size and potency level. We loved the Receptra Naturals CBD oil Active Lifestyle formula. Perhaps the fact that they use hemp flowers is what did it, or the turmeric extract, but something about this formula took CBD to a different level for us. Even if you aren’t an athlete, you’ll really enjoy using it both for how it makes you feel and how it tastes. If you aren’t a fan of turmeric and are looking for only CBD oil, you can always go with their Health and Wellness formula. Receptra Naturals made believers out of us, and they’ll likely make believers out of you too. The only thing we can harp on is that they don’t offer free shipping, but that’s it. This product comes highly recommended by the BestDosage team.